I’ve gathered up some fun, unique and dad-approved gifts for the men in your life. These cool gifts for dad are sure to wow and I’m also including some of my favorite hand made and personalized gifts any dad would love. My girls will be graduating from high school in a few weeks and heading off to college in a few short months and I’m wondering how I blinked and 18 years flew by. My girls are daddy’s girls so I know my hubby is feeling the same way and we will celebrate his being the world’s best dad with a BBQ in our backyard (I’m not that nice – he’s going to do the grilling … but I’ll make cocktails and clean up)! Handmade gifts are always the best especially when kids are young. If you want a unique, personalized and cheap (but not cheap looking) gift for dad, try making my DIY Song Lyric Plate HERE. We personalized one for my hubby years ago with the lyrics to a favorite Bruce Springsteen song. 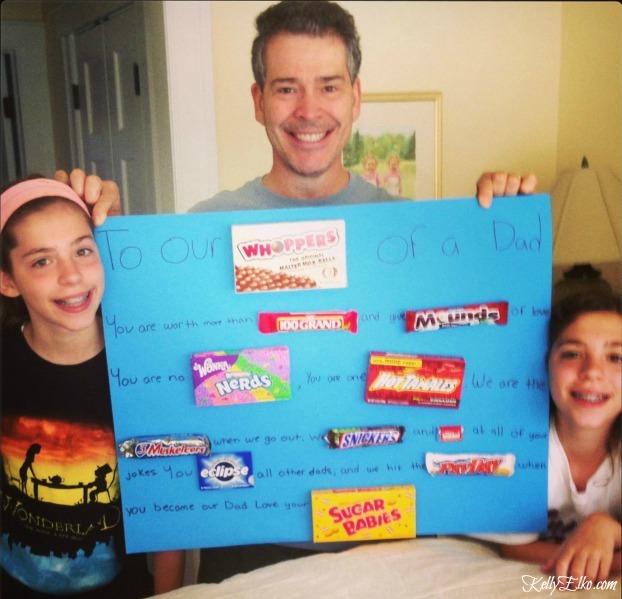 Or kids can make this fun candy gram like my girls made six years ago (excuse the poor photo quality and my hubby’s bed head)! If you’re looking for an extra something to give dad, here are some things I know my hubby would love to get. Sasquatch Cocktail Shaker – this is HUGE and holds 110 ounces of your favorite cocktail. How fun would this be for parties! Wood Slice Genealogy Chart – I love anything that is personalized and this is something that is sure to be passed down through the generations. Kids Names Keychain – pennies are hand stamped with kids (or grandkids) names and the silver disc is for the dad. 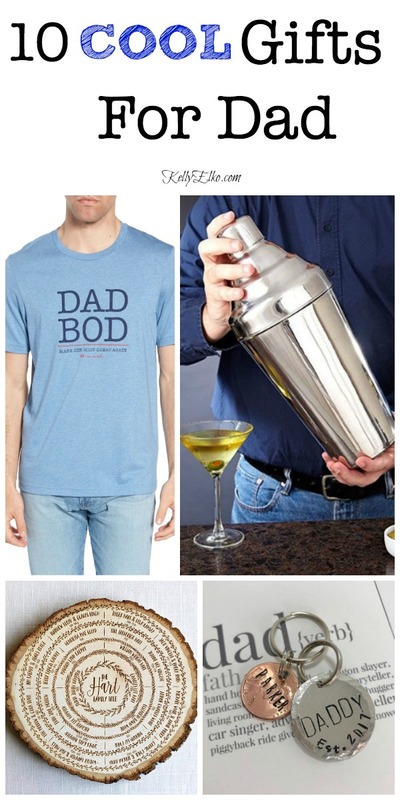 Dad Bod T-Shirt – because I can’t resist a gift that gets a laugh! Giant Tumble Tower – We have this big brother to the tabletop version and it’s a fun outdoor game that can be brought to the beach, park or wherever you need some extra entertainment. Custom Corn Hole – We got these for my hubby last Father’s Day. Choose colors based on dad’s favorite sports team (we got Giants blue and red) for this regulation size corn hole (don’t be fooled by the smaller imitations) that comes with real corn filled bags. Button Down Shirt – I have been seeing these fun small-scale pattern shirts EVERYWHERE and this one is 33% off! Leaf Blower – we have this and love it because it’s not just for leaves! We use ours to easily “sweep” the patio and porch plus it comes with a charger and battery. Rapid Charcoal Starter – If you don’t have a charcoal grill, the one we have and love is HERE (we also have a gas grill but the flavor the charcoal gives food is hands down so much better). I ordered this for my hubby because the charcoals take forever to heat up and now they won’t! Nikes – because all the cool dads are wearing them! We find that we have to order a 1/2 size larger with Nike. Missing my dad after almost three and half years since he passed away and my father in law who’s been gone 15 years – they would have loved that candy gram! Happy Father’s Day to all the amazing dads, granddads and father figures! I clicked over from IG to see this and get the link for the dad bod tee – my boys are always teasing their dad about his dad bod! I can’t wait til they end up with a dad bod too!!! Thanks for the great ideas!!! Enjoy your summer!